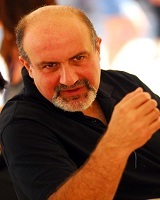 Nassim Nicholas Taleb 1960 American, Lebanese Najib Taleb Minerva Ghosn Scholar, Trader, Economist, Author, Essayist, Investor, Professor, Statistician Lebanese-American essayist, scholar, statistician, former trader, and risk analyst, whose work focuses on problems of randomness, probability, and uncertainty. His 2007 book The Black Swan was described in a review by the Sunday Times as one of the twelve most influential books since World War II. A list of popular Hindi Nassim Nicholas Taleb quotes are given below.